There seems to be a perceived wisdom on young children and competition in that competitive games can upset them and lead to tears before bedtime. It is thus preferable to play lots of cooperative games, along with other games where any competition is incidental and you can pretty much gloss over who has won (or you can go with the “let the wookie win” approach and keep throwing the game, which is a whole other kettle of worms). Indeed, we have generally avoided direct conflict games as they have mostly not gone too well in the past, with the notable exception of Magic: the Gathering, which is purely a slugfest. The thing is, though, that Miss B has been developing quite a competitive streak, though she is usually pretty good when she loses and generally remembers to compliment the winner (sometimes along with an “I’ll get you next time!” comment). Furthermore, over the last six months or so I’ve noticed that she is getting more resistant to cooperative games, which I feel is a shame as I happen to love them! It seems that the problem here is that the game state just keeps getting worse, however hard the players try. Later on she commented about liking to play against people and not “Mr Nobody”, which seems to fit in with this. We’ve always had fun with Castle Panic, particularly when playing with more people, but again I think the problem with the giant boulders is that they are just these big bolts from the blue; at least when monsters are coming, you see them coming and can do something about them. 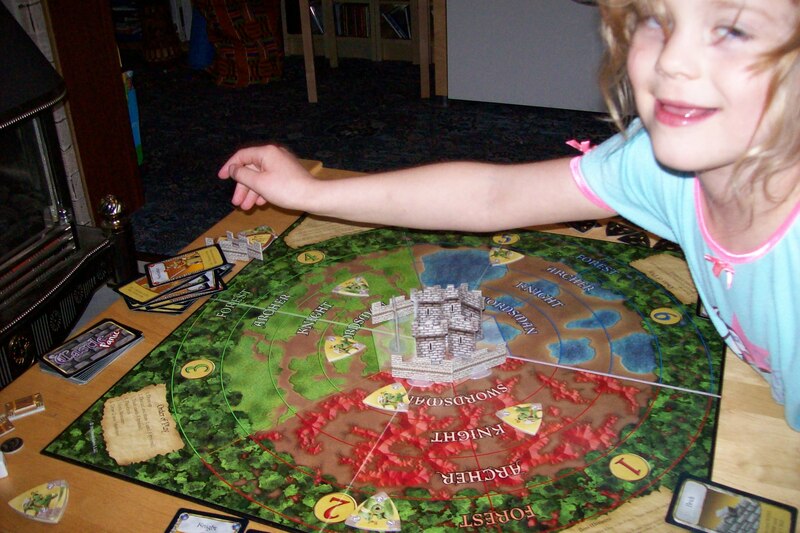 Cooperative games definitely seem to go down best with more people and both Flash Point and Castle Panic can handle six players, which can make them into a real social event which can distract from any deficiencies in Miss B’s eyes. Win or lose, games always seem more exciting if they are close and it really feels like the winner only managed to squeak ahead. I guess that if you lose, this supports the “I’ll get you next time” thing. I should have asked for clarification on that but I didn’t think about it at the time. I think that in general, if Miss B is going to be playing on the same side as everyone else she might as well be playing one of the free-form make believe games that kids play all the time. I wondered about team-versus-team games though. At first Miss B misunderstood me, thinking that I meant when people help each other to play one position in a game between them (as we do sometimes), but I gave her an analogy about football teams. So, team games are okay but individual competition is better. 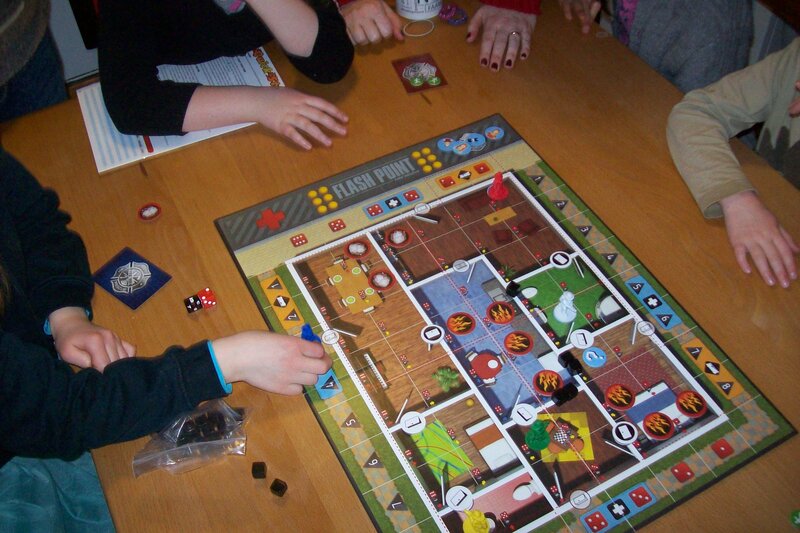 I recently received a very welcome present from the in-laws, a cooperative game called Flash Point: Fire Rescue which is, as the name may suggest, about being a team of fire fighters trying to rescue victims from a burning building. I’d been hearing good things about this for some time, so it was great to have a chance to try it out. Looks like the fire is mostly under control… for now! So the game is pretty straightforward: you move your fire fighter and/or take other actions like extinguishing flames or opening doors, then roll a couple of dice to see where more fire spreads; then it’s the next player. The mechanics quite cleverly make it more likely that existing fires will get worse and new areas generally build up smoke before flames break out. There are two sets of rules: a basic version, where everyone is the same, and a more advanced version where each fire fighter has specialist skills (like first aid, imaging, or dealing with hazardous materials) and other features are introduced like a movable fire engine and ambulance. We have now played the game a couple of times: once with just the two of us and once as part of a games afternoon with five fire fighters (a couple of which were being controlled by a pair of children. Both times we played with the basic rules. Miss B enjoyed the first play, but wasn’t massively impressed. The second time, though, with the bigger group of players, the game really came to life and she was getting really into the swing of things, and she says it is definitely more fun with more people. However, Miss B would like to withhold her verdict until we have tried playing with the specialist fire fighters. So no verdict this time. Some time, hopefully in the near future, we will do this and I will report back. 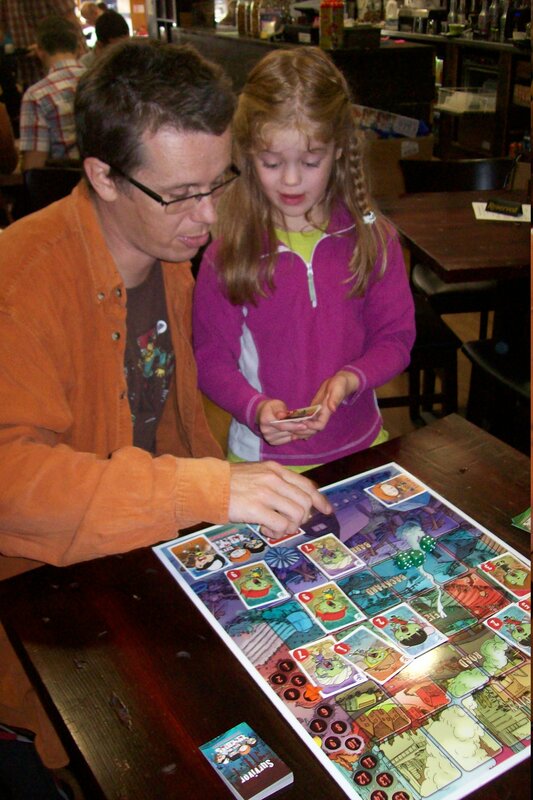 The game: Flash Point: Fire Rescue (Indie Boards & Cards), 2 to 6 players aged 10+.